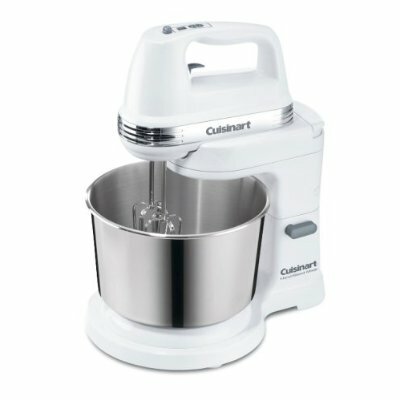 The Cuisinart Power Advantage Hand/Stand Mixer (love the name hand/stand!) A Long-time Baking Need Finally Filled! Although I use my large stand mixers for 99% of cake baking, there are certain applications where a handheld electric mixer does a better job. In those instances, when writing recipes, I recommend a handheld mixer. One instance is when whipping cream that I usually do in small amounts of around 1 cup. Another is beating one or two egg whites. Still another is adding syrup to buttercream or to egg whites. If the syrup lands on the beaters it spins it onto the sides of the bowl instead of into the mixture but with a handheld mixer it is easy to avoid the beaters when pouring in the syrup. To my utter delight, Cuisinart has recently come out with a handheld mixer that can be attached to or detached from it's accompanying stand. The size of the stainless steel mixing bowl is only 3.5 quarts which makes it ideal for these smaller mixtures. But the best part is that after beating in all the syrup, for example, you can attach it easily and quickly to the stand and let it continue to beat, leaving your hands free for other activities. (Note: The whisk attachment goes right up against the side of the bowl making scraping the sides unnecessary but you do need to stop the mixer occasionally to stir in the mixture from the center.) The mixer comes with two standard beaters plus one whisk beater and even dough hooks should you decide to make small quantities of bread dough which, at 220 watts, it can handle. I doubt if I will be using it for bread but for whipped cream and buttercream alone it deserves a permanent place on my kitchen counter. It retails for under $200 but I've seen in on Amazon for $79.